It is a remake of famous Japanese drama “Legal High” who first aired in 2012 on Fuji TV. The courtroom comedy tells the story of Komikado Kensuke (played by Sakai Masato), a serious lawyer who does anything he can to win cases, and Mayuzumi Machiko (played Aragaki Yui), a hard-working rookie lawyer with a strong sense of justice. G﻿o Tae Rim (Jin Goo) is a sharp-tongued and full of arrogance lawyer , but he also has a 100 percent success rate in his cases. He’s the kind of person who believes the purpose of cases is to win, and to lose would be to give up his status as a lawy﻿er and a﻿ human being. He is so talented that as long as you can pay the high legal fees he asks for, a win is ﻿guaranteed. Seo Jae-In (Seo Eun Su) is a hard-working rookie lawyer with a strong sense of justice, who wants to help those in need. JTBC will be making a Korean version of famous Japanese drama “Legal High”! “Legal High” first aired in 2012 on Fuji TV. The courtroom comedy tells the story of Komikado Kensuke (played by Sakai Masato), a serious lawyer who does anything he can to win cases, and Mayuzumi Machiko (played Aragaki Yui), a hard-working rookie lawyer with a strong sense of justice. JTBC’s remake of the Japanese series “Legal High” has found its leading actors! On December 10, it was announced that Jin Goo and Seo Eun Soo have been cast in the leading role for “Legal High.” The drama will tell the story of two completely different lawyers. Go Tae Rim is a lawyer with a 100 percent success rate who knows how to play with the law, and Seo Jae In is a rookie lawyer who believes in the law and justice. The series will be based on the 2012 Japanese drama of the same name. Jin Goo will take on the role of Go Tae Rim, who may be sharp-tongued and full of arrogance, but he also has a 100 percent success rate in his cases. He’s the kind of person who believes the purpose of cases is to win, and to lose would be to give up his status as a lawyer and a human being. He is so talented that as long as you can pay the high legal fees he asks for, a win is guaranteed. Meanwhile, Seo Eun Soo will play Seo Jae In, who may not have had the highest marks in her class but is second to none when it comes to pursuing justice. She wants to be a just lawyer who helps those in need, but when she’s faced with the reality of the societal mentality that “A lawyer who can’t win is useless,” she puts everything on the line and teams up with GO Tae Rim. Jin Goo and Seo Eun-Su are cast in new JTBC drama series “Legal High.” The familiar title should ring a bell, as the drama series is a remake of 2012 Fuji TV drama series “Legal High” starring Masato Sakai and Yui Aragaki in the respective lead roles. Actors Yoon Park, Chae Jung-an and Jung Sang-hoon join the drama 'Legal High' and form a rivalry with Jingu, Seo Eun-su, who was confirmed casting ahead. The drama will be about Go Tae Rim, played by Jin Goo, who is a lawyer with a 100 percent success rate and knows how to play with the law, and Seo Jae In, played by Seo Eun Soo, who is a rookie lawyer that believes in law and justice. With two characters who are completely opposites of each other, the drama is expected to bring laughter and amusement. Yoon Park, Chae Jung An, and Jung Sang Hoon will play lawyers from B&G Law Firm, rivals of Go Tae Rim’s firm. TBC’s Legal High has gone on a casting spree. The latest to announce their onboarding include actors Yoon Park (Room No. 9, Radio Romance), Chae Jung-ahn (Suits), and Jung Sang-hoon (Big Forest). These three will be on the opposite team of the main leads, Jin Gu (Untouchable) and Seo Eun-soo (Hundred Million Stars From the Sky), and they will provide an intense source of rivalry. Legal High is based on a Japanese drama by the same name, which aired from 2012 to 2013, about an almost inhuman lawyer who will stop at nothing and use the most bizarre methods to win his cases. Jin Gu plays the lawyer whose case success rate is 100-percent, and Seo Eun-soo plays a novice lawyer whose faith in the law is 100-percent. This will be a refreshing comic legal drama about how these two completely different lawyers end up working together. Yoon Park, Chae Jung-ahn, and Jung Sang-hoon have confirmed they’ll be playing lawyers from the bigwig B&G Firm, that poses a threat to Jin Gu’s small office agency. Yoon Park plays the ace lawyer of B&G, who learned how to win from Jin Gu’s character. However, he has a gentle charisma that’s completely opposite of his mentor. Chae Jung-ahn plays a partner at the B&G firm, whose main role is to be the source of information. Despite her fragile looks, she’s a skilled, practical strategist who prepares all the countermeasures for the B&G team. Finally, Jung Sang-hoon plays an ambitious lawyer who dreams of winning over Jin Gu. Even though he may look mean-spirited, once he gets drunk, his true disposition shows: a pitiful middle-aged man with many emotional scars. He also blacks out each time he drinks. Actress Moon Ye-Won was cast in drama Legal High. She plays the role of Nam Seol-Hee who is a friend of Seo Jae-In (Seo Eun Su). Actor Jang Yoo-sang was cast in drama Legal High. He plays the role of Kim Il-soo, an intelligence agent of the Taehrim Law Office. He will energize the drama, and will make his presence felt in the movie theater. Dawn early in the morning ~~~! It will also be open on weekends>., <Police station shooting cooperation ~ !! There is a reward to work on Christmas Eve..
Joo Suk-Tae uploaded on Instagram a picture and tagged "Shooting Legal High"
On that day, director Kim Jung-hyun prepared a surprise event to convey the bouquet of flowers every time one of the actors introduces himself, meaning "thank you for coming together". The actors who received flowers informed the audience with a bright smile, a pleasant start. As director Kim Jung-hyun pointed out, "Actually, I will release you as much as you can, let me play as much as I can." Actors continued their pleasant performances in a free atmosphere despite their first script. First script reading for upcoming JTBC drama series “Legal High” took place December, 2018 at JTBC building in Sangam, Seoul, South Korea. Main cast members including Jin Goo, Seo Eun-Su, Yoon Park, Chae Jung-An, Jung Sang-Hoon, Lee Soon-Jae, Kim Byung-Ok and Kim Ho-Jung all attended. As the familiar title might suggest, the drama series is a remake of 2012 Fuji TV drama series “Legal High” with Masato Sakai and Yui Aragaki in the lead roles. Story for the drama series will follow Lawyer Ko Tae-Rim (Jin Goo) with a 100% wining rate and Lawyer Seo Jae-In (Seo Eun-Su) with a 100% sense of justice. “Legal High” first airs February 8, 2019 in South Korea (takes over JTBC’s Friday & Saturday 11PM time slot after “SKY Castle“). On January 3, JTBC’s upcoming Friday-Saturday drama “Legal High” released photos from their first script read-through. The reading took place last month with the full cast: Jin Goo, Seo Eun Soo, Yoon Park, Chae Jung Ahn, Jung Sang Hoon, Lee Soon Jae, Kim Byung Ok, Kim Ho Jung, Jang Yoo Sang, and more. Yoon Park, Chae Jung An, and Jung Sang Hoon play lawyers from B&G Law Firm, rivals of Go Tae Rim’s firm. Yoon Park read for the role of Kang Ki Suk, an ace lawyer at B&G law firm who has a calm and gentle, yet strong charisma. Chae Jung Ahn, playing the lawyer Min Joo Kyung, whose looks belie her personality, put her years of acting experience on full display. Jung Sang Hoon, in his portrayal of the motivated lawyer Yoon Sang Goo, added a unique brevity to the reading, putting his own style and spin to his character. The fingers, the bigger mouths, and the big fingers toward the sky, are full of self-confident Koh Taerim characters who are arrogant enough to feel like something they do not like. In addition, a distinctive hair style attracts attention. Jingu called it a "hook head" and said, "It means collecting money and odds with hooks." If you have a huge amount of money, you can see the value of the Taerim at a glance. 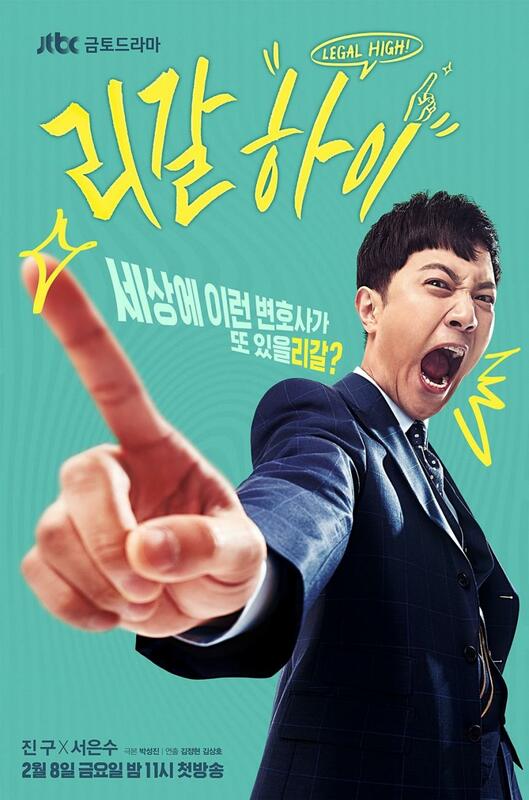 Upcoming JTBC drama “Legal High” has released a new poster and stills! “Legal High” is the remake of the Japanese drama of the same name. It tells the story of an arrogant lawyer named Go Tae Rim (played by Jin Goo), who has a 100 percent success rate and knows how to manipulate the law. He teams up with a rookie lawyer named Seo Jae In (played by Seo Eun Soo), who believes in justice. 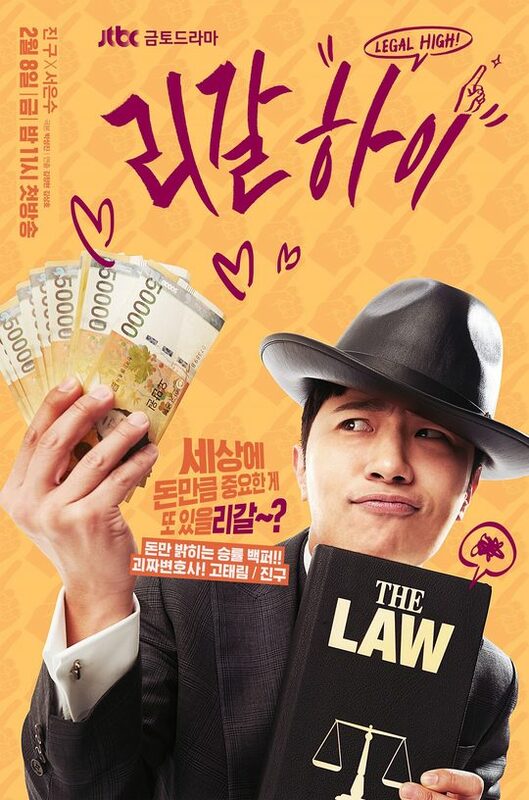 The poster shows Jin Goo’s transformation into a monster lawyer. His unique hairstyle, dubbed the “hook hairstyle,” will be his signature look that conveys his determination to rake in money and success. It also shows that he’ll take on any case as long as he’s paid a hefty legal fee. Teaser trailer added for upcoming JTBC drama series “Legal High” starring Jin Goo and Seo Eun-Su. The drama series is a remake of 2012 Fuji TV drama series “Legal High” starring Masato Sakai and Yui Aragaki. Meanwhile, below is the first teaser poster of the drama series. The teaser poster is of Jin Goo as Ko Tae-Rim. He is a lawyer with a 100% win rate. He cares only about winning his cases and he charges extremely high fees from his customers. The first teaser for “Legal High” is here! 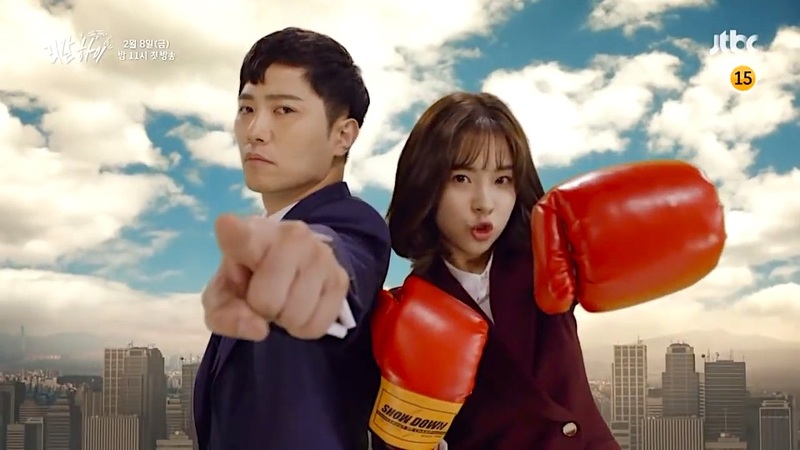 “Legal High” will tell the story of arrogant lawyer Go Tae Rim (played by Jin Goo), who has a 100 percent success rate, and rookie lawyer Seo Jae In (played by Seo Eun Soo), who believes in justice. It’s a remake of the 2012 Fuji TV Japanese drama of the same name. On January 10, JTBC released a remake of the original Japanese drama’s opening clip as the first teaser featuring Jin Goo and Seo Eun Soo. The teaser begins with Seo Jae In running towards Go Tae Rim with some fierce punches. He easily avoids them before knocking her out with just one finger. Out of frustration, she throws a law book at him and hits him on the head. The clip gives viewers a glimpse at the actors’ transformations as their new characters. Jin Goo hinted at his character’s smugness, while Seo Eun Soo comically showcased the vigor of a rookie lawyer. The actress cut her hair and showed the lovely charms of Seo Jae In. It looks fun. Im going to watch it.